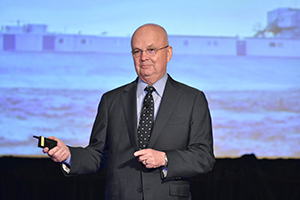 From keynote speaker General Michael Hayden to top executive industry leader panels, members engaged on topics critical to the service and supply sector. Please save the date for PESA’s 2016 Annual Meeting April 6-8 at the Grand Del Mar in San Diego, CA. 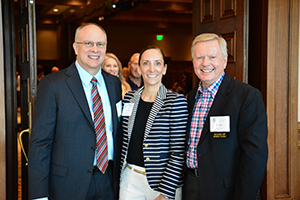 The 2015 PESA Annual Meeting held April 22-24 at the Ritz-Carlton Lodge at Reynolds Plantation in Greensboro, Georgia focused on industry collaboration and efficiency and creating the maximum value throughout the supply chain. Keynote Speaker General Michael Hayden, Principal of The Chertoff Group and former Director of the CIA and NSA, set the stage for a new paradigm in the geo-political landscape where “non-state actors” pose the biggest threats in a world that he says “is more complicated, more immediate, but not the toughest times we have ever lived in.” The key is adjusting to a new environment and a new world where we are all empowered and capable, and equally threatened by the transnational and cyber domain. “States are weak and we have ungoverned spaces that affect the United States. The dangers coming at the U.S. do not have the attributes of a state,” said Gen. Hayden. Gen. Hayden illustrated the emerging definition of nation state that relies on redefining citizenship and leaves the Middle East in a multi-decade long conflict. The key to success is the role of the U.S. and how it is defined. As Hayden points out, in a reference to the quote from Walter Russell Reed, “America cannot be free unless it is prosperous and it cannot be prosperous, unless it is strong.” Citing past foreign policy where U.S. Presidents pledged allegiance with oil producing countries, Gen. Hayden sees new opportunity in a redefined geo-political landscape where resources from North America are game changers in foreign relations. Just like the geo-political map is shifting, so has the industry with North American resources opening a new era of unprecedented production and providing a resource for many years to come. The current cycle, while challenging, is a unique time to explore long-term planning and efficiency throughout the supply chain. 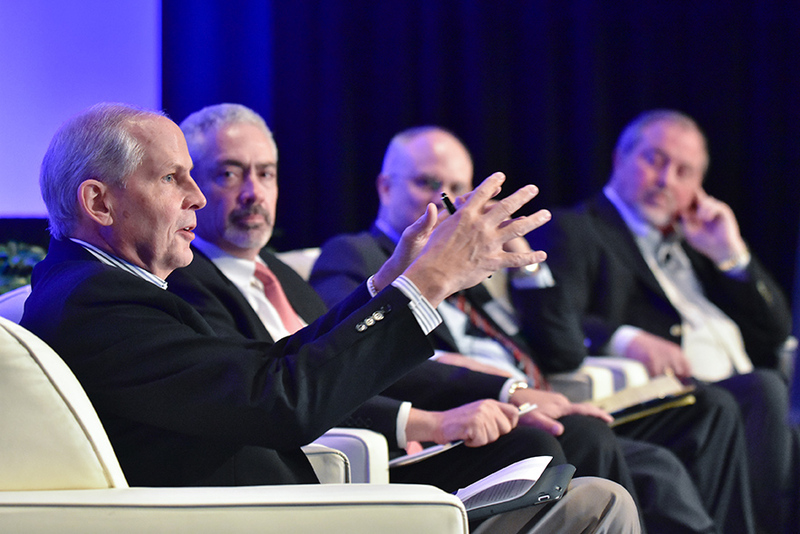 During the onshore panel, the speakers discussed opportunities for collaboration during the downturn and within the current cycle of decreased oil prices in a challenging global geo-political and governmental regulatory climate. “We know what our business is,” stated Jeff Shellebarger, President of Chevron North America Exploration and Production. “We just need to make it profitable and not respond to geo-political events and instead base it on supply and demand.” The volatility in the oil & gas business will continue, but the focus needs to be on collaboration between suppliers and equipment companies and focused on margins. All panelists agreed that foresight and planning is a great opportunity for long-term success and that the forecast moving forward offers tremendous business potential for suppliers and service organizations throughout the supply chain. The collaborative tone includes working together to engage the public to continue making this business viable which means developing trust in the community. “We have to continue to work together to earn the right to operate, by showing that we operate in a responsible and safe manner with a lasting benefit by being engaged in the community,” explained Stover. How we engage with the community in a strong, positive voice will help ensure our mutual success. 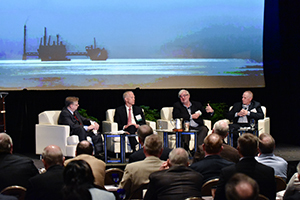 Industry leaders attending the annual meeting shared the optimistic position that the North American resources offer promising prospects for sustained growth and long term prosperity. The outlook beyond the current cycle for the entire value chain offers long-term mutual bottom line success focused on efficiencies that drive towards more effective production. The offshore panel continued the discussion of how collaboration for both exploration and development towards enhancing production efficiencies will determine the outcomes for both service providers and producers. The low oil prices require more of this collaboration to increase production efficiencies and maintaining profit margins. “We rely on standardization, continuity of our contractors, knowledge transfer, and specifications that are within established parameters,” continues Kleckner. The main focus is establishing open communication, starting with early planning and staying on critical path that keeps the project on schedule. This is maintained through the preservation of trained talent which presents both a challenge and an opportunity while managing in the downturn. Accountability, performance, reliability and efficiency are the key metrics to focus on to ensure long term success, however the panelists warn not to sacrifice safety, as this would ultimately have a negative result on both the bottom line and the ability to operate effectively. Miller emphasized process safety, well safety and personal safety as equally important in a continuum that encompasses the entire spectrum throughout the supply and production chain. Upgrading personnel, retiring rigs, and consolidation are all ways to increase capital and production efficiency, but ultimately the industry relies on the collaboration between operators and service providers as they examine new business models to improve production efficiency through best in class engineering expertise. This year’s annual PESA Meeting reinforced the ultimate goal of collaboration to maximize resources and secure opportunities that improve efficiency in technology, production and workforce. The event helped solidify the resolve of all PESA members and industry producers to cohesively integrate through team-based communication strategies best practices and shared expertise.